A 49-year-old male presented to his primary provider with a 6-month history of unilateral resting tremor and tingling facial sensations. Cranial MRI revealed a 6 × 3.1-cm hemorrhagic lesion in the right temporal lobe (Figure 1). The patient underwent gross total resection (GTR) revealing tissue consistent with glioblastoma multiforme (GBM). While the large lesion was in close proximity to multiple meningeal structures, neither imaging nor intraoperative assessments strongly indicated leptomeningeal disease. However, neuroblastic foci positive for synaptophysin with a Ki-67 proliferation index approaching 100% were also identified. As a result, the diagnosis of GBM with primitive neuroendocrine tumor (PNET) features was made. The patient underwent adjuvant volumetric-modulated arc radiation therapy (VMAT) at 59.4 Gy in 1.8 Gy fractions followed by a stereotactic radiosurgery (SRS) boost at 17 Gy to the 50% iso-dose line to an area of residual enhancement. Adjuvant temozolamide was also provided. Imaging performed 1 month after completion of the patient’s initial course of treatment showed dural-based lesions in bilateral frontal lobes that were also hypermetabolic on positron emission tomography (PET) (Figure 2). 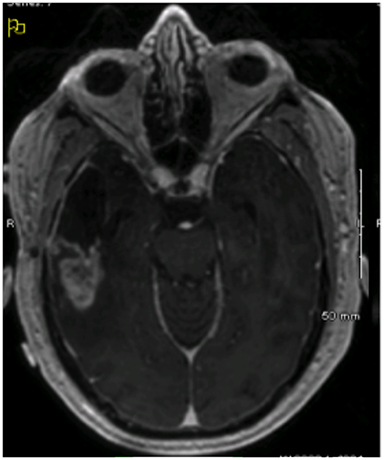 Hence, approximately 8 months from initial surgical resection, the patient underwent a left-sided craniotomy and GTR of the largest lesion, which confirmed an out-of-field, contralateral recurrence of his GBM with PNET features. Another round of adjuvant radiation via VMAT at 55.8 Gy with concurrent temozolamide was initiated, targeting the resection cavity and the right-sided lesion. The patient retained stable functional capacity with no new neurological symptoms or complaints. However, follow-up imaging showed a local recurrence in the right temporal lobe where the initial resection had been performed 12 months earlier (Figure 3A). The patient started a regimen of etoposide and vincristine, but after 1 cycle, he developed seropurulent drainage from his craniotomy site with projectile vomiting, neck stiffness and low back pain. He was diagnosed with acute meningitis requiring craniectomy with bone washing and intravenous antibiotic therapy. After recovering, he began a regimen of procarbazine, lomustine, and vincristine (PCV) with bevacizumab. Subsequently, resolution of the previously noted contrast enhancement had resolved, and all therapies were discontinued. Nevertheless, in the follow-up 24 months after his initial craniotomy, imaging revealed another local recurrence with contrast enhancement in the temporal lobe (Figure 3B). With minimal morbidity and stable performance status, the patient wished to pursue aggressive treatment, so the recurrent area was given a third round of VMAT to 39.6 Gy with concurrent temozolamide and bevacizumab, followed by adjuvant etoposide, carboplatin and bevacizumab. Two months following therapy, the patient complained of weakness, somnolence, weight loss and low back pain. Brain imaging remained stable, but spinal imaging demonstrated extensive leptomeningeal disease. Although a palliative course of radiation was initiated, the patient succumbed to his disease shortly thereafter, approximately 28 months following initial diagnosis and resection. Initial diagnostic MRIs showed a heterogeneously enhancing mass in the right temporal lobe with peritumoral edema, midline shift, and uncal herniation. The T1 phase of this exam is provided in Figure 1. Functional MRI also revealed language localization of the left, and the mass to be separated from the motor strip. The patient’s initial recurrences in bilateral frontal lobes were also enhancing, yet more homogenously, and were closely approximated to the cerebral meninges. This exam, as well as a PET/CT of the brain showing the increased metabolic activity at these sites, is shown in Figure 2. 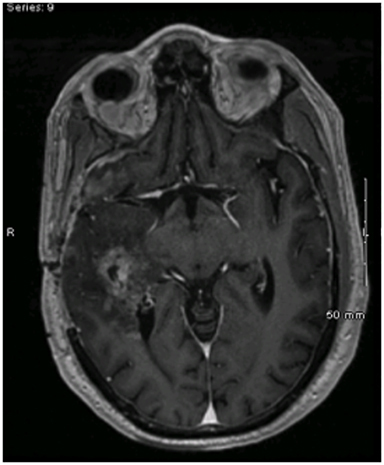 After treatment for these lesions, follow-up imaging showed a local recurrence at the initial site following a second round of radiation and temozolamide therapy (Figure 3, left), followed by persistent disease after an additional 12 months of chemotherapy and a lengthy hospitalization for meningitis (Figure 3, right). And finally, the patient’s disease eventually spread to his sacral spine via leptomeningeal dissemination, which was seen on lumbosacral MRI exams as “sugar-coating” confluent lesions of the cauda equina and thickening of the surrounding meninges and dura. Multipally recurrent glioblastoma multiforme (GBM) of the right temporal lobe with primitive neuroendocrine tumor (PNET) features and leptomeningeal dissemination. Currently, standard treatment for GBM includes local radiation therapy and temozolamide. Although GBM has classically been considered a purely astrocytic tumor, lesions with mesenchymal and epithelial constituents are increasingly being described. GBM with PNET components are thought to represent approximately 0.5% of GBM cases, and arise from the development of PNET-like foci within pre-existing gliomas. In contrast to conventional GBM, PNETs typically have a histology similar to medulloblastoma and are often managed with combined craniospinal radiation and platinum-based chemotherapy. Our experience is consistent with the scant literature and clinical guidelines concerning management of GBM-PNETs. Conventional GBM tumors rarely undergo metastatic spread, and standard management is directed toward the control of local disease. As identifying PNET components in GBMs may have prognostic and treatment ramifications, the method of tumor sampling during biopsy may influence management considerations. Tumors are spatially heterogeneous; therefore, determining both the distribution and functionality of PNET foci within primary lesions is likely help predict clinical behavior. One study suggests that the diffusion coefficient on MR imaging may help distinguish astrocytic and ectodermal tumor components, potentially guiding biopsies. GBM-PNET tumors are aggressive neoplasms of mixed embryologic origin that demonstrate high rates of local recurrence and dissemination into the CSF. Our patient with GBM-PNET was treated with multiple courses of surgery, radiation and chemotherapy. Therapy provided favorable local responses with an overall survival of 28 months after extensive therapy without debilitating morbidity. The patient tolerated his multiple courses of radiation therapy with minimal complaints of acute toxicity, and, unlike many high-grade glioma patients who do not survive long enough to experience late toxicities, he experienced late toxicity only in the last weeks of his survival. The patient did, despite all aggressive therapy, eventually manifest leptomeningeal spread, which led to a rapid symptomatic decline and death from his disease. This case suggests that aggressive therapies may be utilized in attempts to prolong survival with acceptable toxicity during this period in select patients with favorable performance status. And furthermore, patients with diagnoses of GBM-PNET may benefit from advanced techniques of diagnostic imaging and pathologic analysis, as well as craniospinal irradiation and early platinum-based chemotherapy due to the propensity for CSF dissemination. Hegi ME, Diserens AC, Gorlia T, et al. MGMT gene silencing and benefit from temozolomide in glioblastoma. N Engl J Med. 2005;352:997-1003. Sarkar C, Deb P, Sharma MC. Recent advances in embryonal tumours of the central nervous system. Childs Nerv Syst. 2005;21(4):272-293. Perry A, Miller CR, Gujrati M, et al. 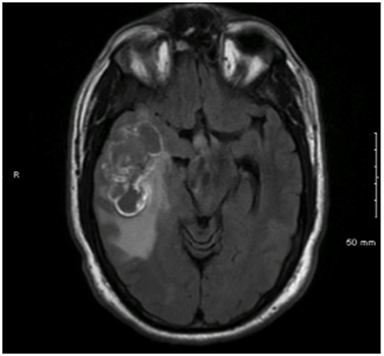 Malignant gliomas with primitive neuroectodermal tumor-like components: a clinicopathologic and genetic study of 53 cases. Brain Pathol. 2009;19(1):81-90. Stupp R, Mason WP, van den Bent MJ, et al. Radiotherapty plus concomitant and adjunat temozolomide for glioblastoma. N Engl J Med. 2005;352:987-996. Johnston DL, Keene DL, Lafay-Cousin L, et al. Supratentorial primitive neuroectodermal tumors: a Canadian pediatric brain tumor consortium report. J Neurooncol. 2008;86(1):101-108. Hong TS, Mehta MP, Boyett JM, et al. Patterns of treatment failure in infants with primitive neuroectodermal tumors who were treated on CCG-921: a phase III combined modality study. Pediatr Blood Cancer. 2005;45: 676-682. Song X, Andrew Allen R, Terence Dunn S, et al. Glioblastoma with PNET-like components has a higher frequency of isocitrate dehydrogenase 1 (IDH1) mutation and likely a better prognosis that primary glioblastoma. Int J Clin Exp Pathol. 2011;4:651-660. Ali S, Joseph NM, Perry A, et al. Apparent diffusion coefficient in glioblastoma with PNET-like components, a GBM variant. J Neurooncol. 2014;119:353-360. Mirimanoff RO, Gorlia T, Mason W, et al. Radiotherapy and temozolomide for newly diagnosed glioblastoma: recursive partitioning analysis of the EORTC 26981/22981-NCIC CE3 phase III randomized trial. J Clin Oncol. 2006;24(16):2563-2569. Packer RJ, Gajjar A, Vezina G, et al. Phase III study of craniospinal radiation therapy followed by adjuvant chemotherapy for newly diagnosed average-risk medulloblastoma. J Clin Oncol. 2006;24(25):4202-4208. Chu A, Bourgeois DJ, Prasad D. A responsive yet persistently recurrent GBM with PNET features. Appl Rad Oncol. 2015;4(4):28-30. Prepared by Dr. Chu, a 4th Year Medical Student at the Jacobs School of Medicine and Biomedical Sciences, University at Buffalo, SUNY, Buffalo, New York; Dr. Bourgeois, a PGY-4 Resident Physician in Radiation Oncology at Roswell Park Cancer Institute, Buffalo, New York; and Dr. Prasad, Professor of Radiation Medicine, Neurosurgery, and Oncology; Staff Physician in the Radiation Oncology Department; Pediatric Radiation Director; Gamma Knife Center Director; and Medical Director of the Radiation Medicine Department, Roswell Park Cancer Institute.